Magic Theatre Arch is located off of the Kane Springs Road near Moab, Utah. The unsigned trail begins at the Amasa Back trailhead where it crosses the road and travels beneath the False Kiva Petroglyphs site as it heads into a short side canyon. Before reaching a large alcove that is at the head of the canyon the trail turns and climbs through a pass to a hidden valley and to the arch. 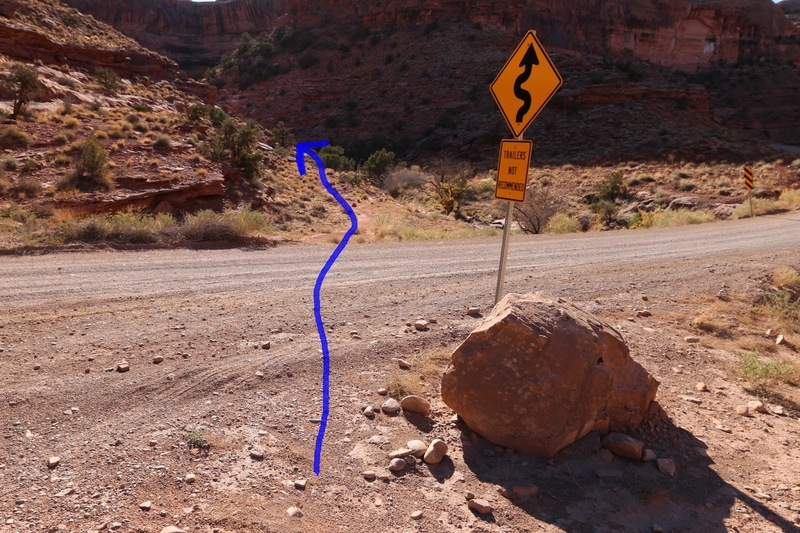 The Amasa Back trailhead is about 5.3 miles from Moab measuring from the intersection of Highway 191 and Kane Creek Blvd. Turn onto Kane Creek Blvd. at the McDonald's Restaurant and follow it as it parallels the Colorado River for about 4.6 miles before turning up Kane Creek. 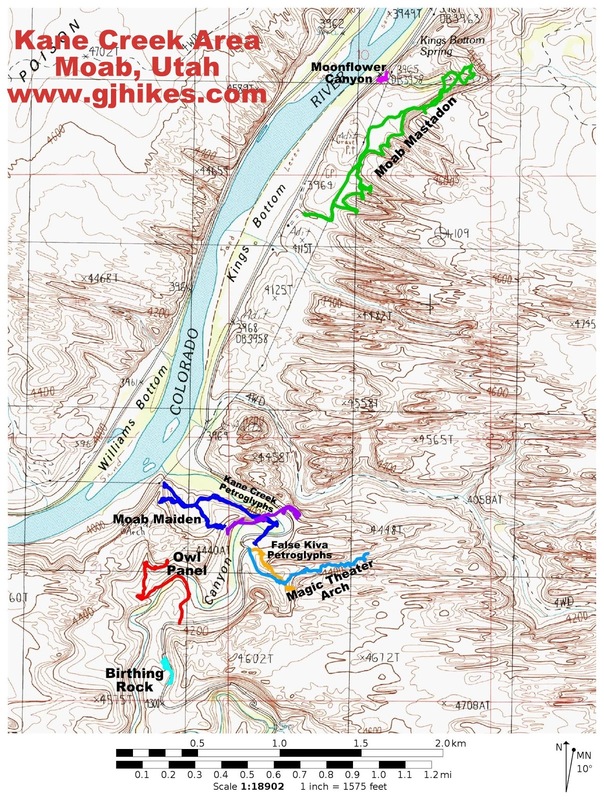 The Jackson Hole trailhead is at the 4.6 mile point and the Amasa Back trailhead is near the 5.3 mile point. From the Amasa Back trailhead look for a well worn trail that travels into the side canyon on the other side of the road. There is a short hiking trail marker near the start of it. 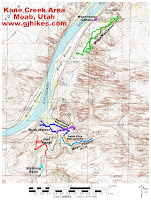 As the trail wraps around the point of the hill and into the canyon be sure to follow the route that travels near the wash.
Watch for a cairned route that crosses the wash and begins climbing the hill on the east side. The trail does a lot of scrambling to get up and through the pass. This particular ledge has a pile of rocks for a step. As the trail climbs higher it becomes more obvious in places and the cairns are no longer necessary. The route gets pretty primitive as it scrambles up the pass. Getting good traction on the slickrock and boulders is needed for the last little bit of the climb. Right where the trail levels off there are some petroglyphs on the cliff on the left hand side of the trail that are worth checking out. Once you get over the pass it is a pleasant stroll for the rest of the way to the arch. If you want to see the blue sky between the arch and the cliff you will have to scramble up some steep slickrock to get to the alcove. There is one spot that you can see a small piece of the gap from the wash when the arch first comes into sight. While Magic Theater is far from the most impressive arch that the Moab area has to offer it is hard to argue with the view. Given more time there is a lot more exploring that can be done by going on past the Magic Theater Arch. On the day that we took the photos for this post we saw 2 other groups of hikers. One of them started out by following the False Kiva Petroglyphs trail on their trip in and the regular route on their return trip. Magic Theater Arch is one of the lesser known trails that you can find around Moab that gets a lot less traffic than the regular tourist stops. If you would like to see it for yourself then all you have to do is 'Take a hike'.